In case you misssed it, Santanna Blue Chip, a very well performed son of Art Major, has not performed well enough in the competitive North American market to warrant keeping him standing as a sire. So he has been working up again as race horse, and winning! See article and video of his qualifying trial and another article from Canada where he is now racing. What effect does that have on breeders here who have gone to him as a sire? It leaves you a bit stranded. But don’t panic. The fact is he has not produced the 2yo excitment machines that a sire must have to make his commercial mark and this creates difficulties for you as a breeder/owner. In New Zealand we often stand back from new sires, so he has taken time to even get a foothold. He was not available this year and will no longer be a “Sales” sire although a great individual type can still sell well. But that doesn’t mean that your foal/yearling/2yo/3yo can’t run. The sire has some great genes, and is a very athletic horse. He was competitive with Somebeachsomewhere (who has young progeny that have some very good Downunder trainers scratching their heads, by the way). Santanna Blue Chip – handsome and athletic at the Alabar Parade a few years ago. Personally, I think Santanna Blue Chip’s pedigree may be better suited to our Direct Scooter line here, which he has through his maternal side and of course we do too, and through the best local siring lines as well. Or maybe, like so many excellent top racehorses, he lacks the dominant siring gene that stamps progeny with the very things he did so well. That is such a tall order. Very very few stallions have it, or have the luck to find the mares they need to show it. The standards for commercial sires is brutal and quick, but hindsight shows time and certain nicks can produce very good individuals – or that the sire fits a particular niche in breeding/training that is really important. I would class Elsu in that latter category. Not a sire of Group 1 horses but great bread and butter horses for owners and trainers who want horses that try hard and are consistant and willing, and increasingly showing up some classy types. Bread and butter makes a great pudding!! (A tip o’ the hat to Richard’s wife Barbara who makes great B&B Puddings he says). I was in the same position when Island Fantasy (great breeding, good race results, handsome sire) was a potential sire, only to find he was gone and I was left with a pretty but not commercial yearling. It’s part of the learning curve. In the end, the individual horse will perform or not. If you have a nice type by Santanna Blue Chip, don’t be afraid to feel positive about that horse. Put into it what you would if the sire had been top of the siring pops in North America. Because it’s different here, and each horse has it’s own ability, with 50% coming from your mare. I saw Santanna Blue Chip at the Alabar parade a few years ago (see photo) and thought he was a very athletic and handsome individual. And the few yearlings I’ve seen at Karaka Sales were lovely types. It all just shows how damn hard it is to get even a foot hold into a market that makes unreasonable demands and rewards only those few who have the genetics and luck to become successful sires. Hi Beryl. Good article , It will be interesting to see his progeny over the next couple of years, and how they perform, hopefully well. 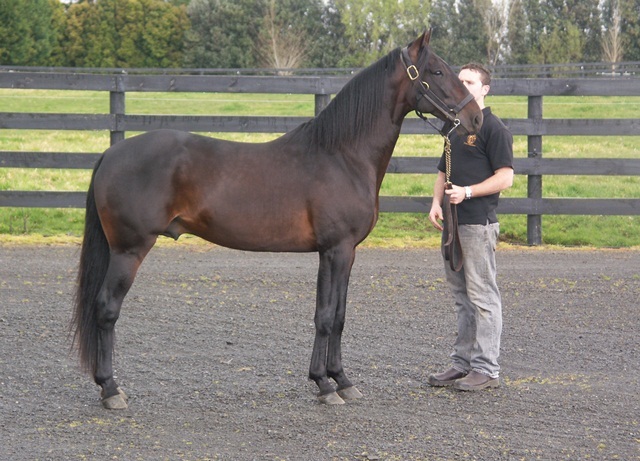 StandardBred And Breeding Foa All.